I was living in Europe when Clarke, an original member of Depeche Mode, broke up his wildly successful synth-band Yazoo and started searching for a vocalist for a new group. I caught one of Erasure's very first shows, at a small club in London, where Andy Bell managed to sound disturbingly like Yazoo's Allison Moyet, and they brought the house down - most especially when Bell sang Abba's "Gimme Gimme Gimme" in leather jacket, motorcycle boots, and a pink tutu. Erasure topped the charts in the UK and had some pop success in the US as well, but have usually been seen as the lightweights of the holy trinity of surviving 80s synthpop bands (the others being Depeche Mode and the Pet Shop Boys). Certainly DM and PSB are musically more complex and topically darker, but while there's no shortage of critics who don't think much of Erasure as musicians, the real problem is that they write pure pop love songs, and that is just so not cool. Union Street's first cut was also the first single, and if they wanted to set the bar high, they succeeded. "Boy" is killingly beautiful, and had been all but lost in its original version on 1997's Cowboy. I wondered, in fact, how I had missed it, and just put Cowboyin the CD player and thought... ok, that's how. Is the rest of the album as good as "Boy"? No, it's not, but most of it's very good indeed. For instance, their little trip through the back catalog turned up "Tenderest Moments," a b-side I'd never even heard before and that almost hits the heights of "Boy." And the guitars in this one, by Clarke as well as Walsh, are almost as purty as Bell's vocal. 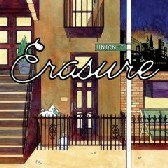 Erasure have taken a chance with Union Street, but then their continued insistence on making music this purely honest, tender and revealing is in itself taking chances in the face of hipster irony and designer miserablism. And don't we all need that now and then?